Tucked along the sea to sky highway on the way between Vancouver and Whistler is the small adventure town of Squamish B.C. The drive from Vancouver is the best in the world as it's view of the Pacific Ocean during sunset with all the islands poking up out of the water is amazing to behold. 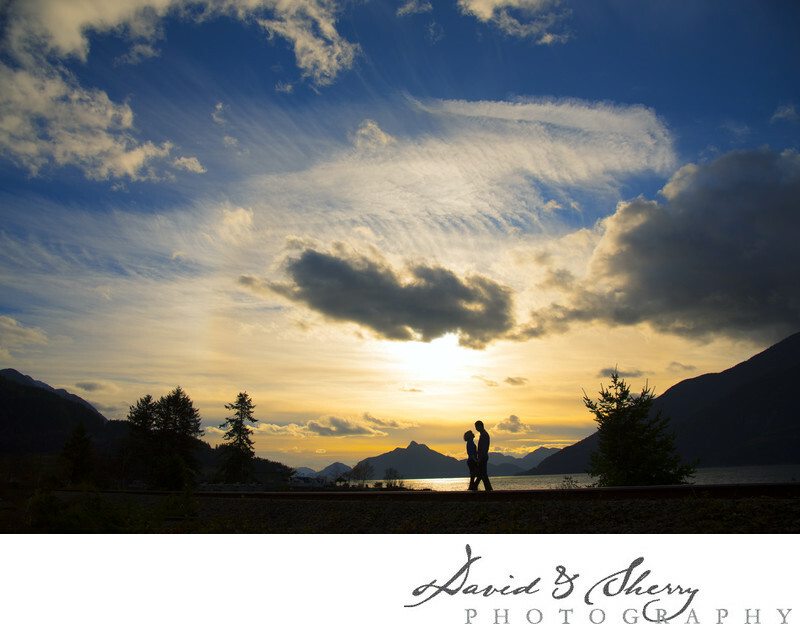 This is also a great place to take wedding photos and we love being photographers of weddings in Squamish and the surrounding areas. In this photo during sunset a bride and groom are silhouetted against the orange sky with the mountains dominating the landscape. There are wonderful places to take pictures in the area including Tantalus Lookout, Sea to Sky Gondola, Moonlight Dock, Porteau Cove, Alta Lake Mountain Way, Wedgemount Glacier Lake, Sunwolf, Lost Lake, Garibaldi Tusk and Alice Lake are all beautiful places to take wedding photos nears Squamish. A gorgeous mountain landscape on the Pacific Ocean is a thing to wonder. It is made even more amazing by a gorgeous sunset as the sky turns orange and the shadows of the mountains are punctuated by the contrast cause by direct light. When a couple for their pre-wedding photos is included in the composition by creating a silhouette against the colourful sky the finished product becomes a thing of beauty. This type of landscape meets engagement and wedding photography is what we call Couplescapes and this one in particular we would call an Epic Couplescape. Just outside the city of Squamish, B.C. Canada is where this location exists. Near the world famous resort of Whistler on the Sea to Sky Highway we are brought into contact with wonderful vistas and we get to choose which ones to photograph with our wonderful clients. Whistler wedding photography, Squamish pre-wedding photos and pictures of engaged couples for their engagement portraits are things which are wonderful to accomplish in and in between the small towns between Vancouver and Whistler. Luxury wedding and family portraits can be achieved by photographers David & Sherry throughout Vancouver, Whistler, Squamish, Banff, Canmore, North Vancouver, Langley, Coquitlam, the Fraser Valley, Abbotsford, Hope, Kamloops, Merritt, Kelowna and Calgary. Take a look through our epic portfolio for awesome couples like you. We love being Squamish Wedding Photographers. Squamish is located on the Pacific Ocean in B.C.